Epilepsy is a seizure disorder in dogs. It’s not thoroughly understood but epilepsy in dogs is believed to be similar to epilepsy in humans. 1. During the prodome phase your dog’s mood and behavior will begin to change. This is the period leading up to the seizure and it may occur minutes, hours or days before the seizure. 2. The aura or pre-seizure stage occurs a few minutes before the seizure. During this time your dog may be restless. He will probably pace, look for affection, salivate, whine or even try to hide. Some dogs may bark, tremble or urinate. 3. The Ictus is the seizure itself. Some dogs may lose consciousness. It’s not uncommon for a dog to gnash his teeth, work his jaws, throw his head around, or thrash with his legs. Dogs may drool, cry, paddle their paws as though they’re running. Some dogs may lose control of their bladders or bowels. During this stage the dog is unaware of you or his surroundings. The Ictus stage usually lasts about five minutes. 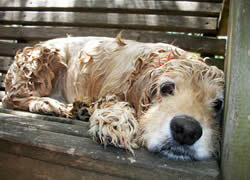 For some dogs the seizure may be localized to one area such as a leg or the face. 4. During the post-Ictal phase your dog will be in a recovery period. He may appear to be disoriented and uncoordinated. He may be temporarily blind. This period can last from a few minutes to a few days. Some dogs will simply go to sleep during this time. The actual causes of epilepsy in dogs aren’t known, nor are the triggers for the illness, though there are some things which seem to lead to seizures. There are actually two kinds of epileptic seizures: idiopathic, in which the causes are never known, and secondary, in which the epileptic seizures are the result of some other dog health problem which can be discovered and possibly treated. Seizures can be further divided into partial seizures, which may only affect part of the body; and generalized seizures, which come as petit mal seizures (in which the dog simply loses consciousness), and grand mal seizures, in which the dog has a full-fledged seizure with uncontrolled muscle activity, drooling, loss of bodily functions, and loss of awareness. Status Epilepticus, or Status, is a kind of epileptic seizure in which the seizures come one after another, without the dog having a chance to recover from the previous seizure. This condition may last for hours and it is very serious. You should seek veterinary help immediately if this condition occurs. Many owners report that their dogs have suffered seizures following a time of excitement, even if the dog was happy, suggesting that the excitement was perhaps a trigger. Epilepsy in dogs usually begins between the ages of six months and five years old. It most commonly begins when dogs are 2-3 years old. It occurs in all breeds and mixes, though there is some belief that it is familial and can be passed from parents to puppies. If your dog is having a seizure it’s very important for you to carefully observe the symptoms. As you can see, there are different forms of seizures and treatment will depend on the kind of seizures your dog has. You will need to describe them in as much detail as possible to your veterinarian. Your vet may not be able to begin real treatment for canine epilepsy until your dog has had more than one seizure and a pattern is observed. You should be aware that treatment for epilepsy in dogs does not cure the problem. The goal is always to decrease the occurrence of seizures, their duration and their severity. There are several drugs used to treat canine epilepsy. Your veterinarian may need to try several medications, or combinations, before you find something which is effective for your dog. The most commonly used drugs for epilepsy in dogs are phenobarbital and potassium bromide (KBr). These medications are given daily. Your vet will need to monitor your dog’s blood levels periodically and there will be some occasional lab work. After your dog begins taking medication for epilepsy it is VITAL that he does not suddenly stop taking the medication or skip a dose. If he does he could have a severe seizure. Most dogs who begin anticonvulsant therapy for canine epilepsy will need to continue to take the medication throughout their lives. It is not unusual for phenobarbital and other anti-epileptic drugs to have effects on the liver, so your veterinarian may need to perform liver function tests from time to time as a precaution. Your veterinarian may adjust your dog’s medication dosage from time to time in response to your dog’s seizures. There is no specific prevention for epilepsy in dogs since there is no specific known cause. However, dogs which have canine epilepsy should not be bred since epilepsy is believed to be passed through heredity in some cases. Clearly, any canine health problems that your dog has, such as infections, traumas, exposure to toxins and other things that could lead to epileptic seizures, should be treated promptly to reduce the chance that a seizure could result. Remove any sharp objects so he won’t injure himself if he thrashes around. Remove children and other people from the room. Keep your hands away from your dog’s head. He is likely unaware of you and he could accidentally bite you. Lower your dog to the floor if he is off the ground. If the seizure lasts for more than three minutes you should call your veterinarian, or if your dog appears to have one seizure following another. If your dog does have a single seizure it doesn’t mean that he has canine epilepsy. It is not usually considered an emergency. Instead, you should call your veterinarian and report it. Make sure you make a record of the date and time it occurred, as well as how long it lasted. If your dog has another seizure, you should take him to the veterinarian.